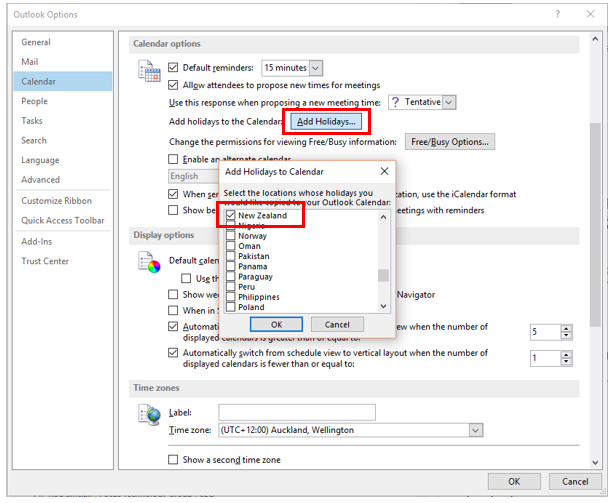 If you would like your Outlook calendar to include all the public holidays, you do not have to Google them and insert each and every one of them individually into your calendar. Outlook can automatically add them to your calendar for you! And there are almost 100 different locations to select from. So, if you would like the public holidays of Nicaragua or Down Under, simply select that box and they will appear in your calendar. Click on File | Options | Calendar | Add Holidays and select the countries that you are working with. These are added as All Day Events, so you can set reminders or apply colors if you like. Wonderful, but my joy was short-lived. And what country might that be Tony? Barbados. A little Caribbean island. But we show up on drop-down lists of most online forms, so why not a big one like Microsoft Outlook Calendar. I really do not know Tony, but I promise I will look into it and get back to you. Thank you for bringing this to me attention.